The pavilion of the Sultanate at the China-Arab Expo, which ends on Saturday, has witnessed great interest from visitors to the exhibition over the past few days. 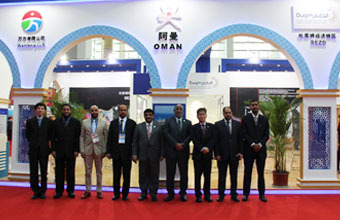 Officials from the Special Economic Zone Authority in Duqm (SEZAD) and the Wanfang Oman Company provided a detailed explanation to visitors about SEZD in terms of the investment climate, geographic location and facilities offered by SEZAD to investors and projects currently in SEZD and the investment of Wanfang Oman Company in Duqm. A number of publications were also distributed, including a booklet on investment in Duqm in Chinese. The visitors had also the chance to taste Omani halwa (delicacies) that impressed them. Representatives from 47 countries, executives from 1,080 companies, and 5,000 exhibitors covering 31 industries ranging from transport to huge data attended the exhibition, held in Yinchuan, capital of northwest China's Ningxia Hui Autonomous Region from 6 to 9 September.